Lorton, Virginia is one of the state's most stark cases of environmental injustice. Lorton hosts three landfills, a sewage sludge incinerator and one of the largest and dirtiest trash incinerators in the nation. Covanta Fairfax is the third largest trash incinerator in the nation and is the biggest air polluter in Fairfax County. According to the latest EPA data, they're solely responsible for 75% of the industrial air pollution in Fairfax County, and they're the largest source of nitrogen oxide pollution within 20 miles of DC, contributing to asthma attacks -- emitting even more than the two airports in the area. This is during normal operation. Clearly, the uncontrolled fire makes things much worse. Washington, DC dumps and burns a lot of waste in Lorton, and DC residents have worked to put an end to this. See the article on DC's Waste and Environmental Racism for some of the history. 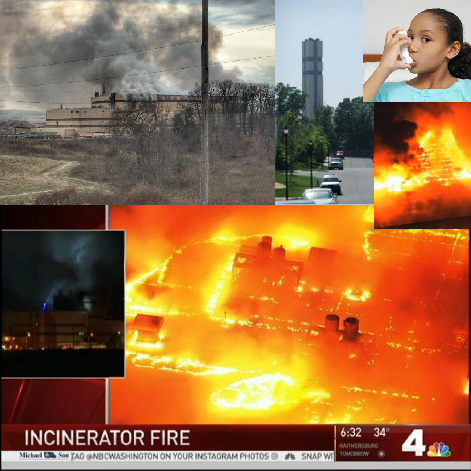 More info on the incinerator is available from the effort in 2015 of 21 groups to stop DC from contracting for 5-11 more years of burning waste in Lorton: http://www.energyjustice.net/dc/wastecontract. Unfortunately, DC cut the contract anyway, but without a minimum commitment of waste, so allies in DC still hope to keep DC from dumping on Lorton without waiting for the contract to end. See these links for general information on incineration, environmental racism, or zero waste alternatives. The flyer on the February 2017 fire at the Covanta Fairfax incinerator in Lorton is here. More content to come as we develop this page. To get involved, please contact Mike Ewall.